Elon is buzzing as the underclassmen have returned to campus. The first College Coffee has passed. Week one of Fall semester is almost over. And as the syllabi, assignments, blog posts and readings pile up, I am beginning to miss the relative tranquility of Boot Camp. This semester is jam-packed with three production classes (Producing Interactive Media, Visual Aesthetics, and Interactive Writing and Design) and two theory courses (Theory and Audience Analysis, and Interactive Media Strategies). 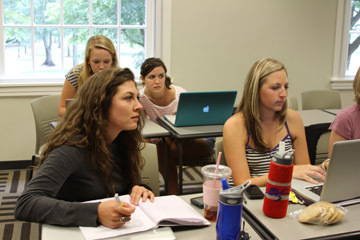 Elon iMedia graduate students work on projects in Powell 210. Most of the class has already pulled their first late night lab session to finish Flash assignment number one. We’ve had the first pro seminar to start thinking about our futures. Life as an iMedia graduate student has truly begun. We’ve only got nine months and there is a lot to learn. It’s time to say goodbye to friends, family, food and sleep (My cat has already learned that the only way to get my full attention is to walk across my keyboard when I am trying to fix an ActionScript 3.0 error). If you are looking for me this year, you will likely be able to find me on the second floor of Elon’s Powell building. I don’t really plan to leave until I’ve conquered all I can.